When John Bierbaum was a student, every day started the same at Normal Community West High School (NCWHS): Principal Jerry Crabtree ’71, M.S. ’72, Ed.D. ’93, would finish homeroom announcements by exclaiming, “It’s a great day to be a Wildcat!” Today, the sentiment remains true for Bierbaum ’05, M.S. ’09, who is now a NCWHS social studies teacher and was named as one of 11 finalists for this year’s Illinois Teacher of the Year award. 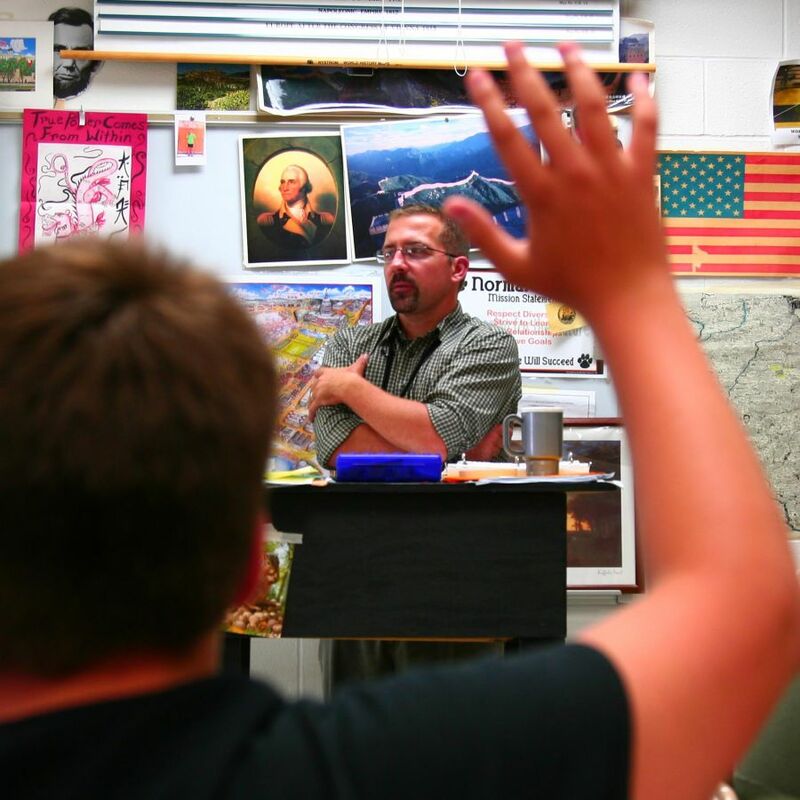 Bierbaum returned to his high school alma mater to student teach and was subsequently hired by the school after earning his degree in social science education from Illinois State University. 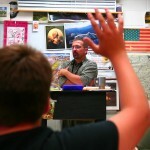 With an abundance of role models, his passion for teaching shows in everything he does. One of those role models was former Brigham Elementary School fifth grade teacher Brett Cobb-Clark. Bierbaum said Cobb-Clark was “so cool” because he always found ways to help children apply what they were learning to their world outside of class. “Mr. Cobb-Clark would sit on the corner of his desk like Socrates, eating an apple” said Bierbaum. When the bell rang signaling class was over, he would take the last bite of his apple and say, “Hey, if any of you want to stop by during lunch, we can play a little chess and keep talking.” To this fifth grader that was an opportunity too good to pass up. While Bierbaum may not have made the decision to become a teacher in fifth grade, by the time he entered NCWHS, he knew exactly what he wanted to do. “My [twin] brother knew he was going into the Marines and I knew I was going into the classroom,” Bierbaum said. He said if he had any doubts, one very special teacher high school sealed the deal. That teacher was none other than alumnus Steve Mintus ’74, M.S.Ed. ’02, who now serves as the school’s assistant principal. Bierbaum said he continues to be inspired by his former teachers, who are now his colleagues, and that his nomination as the Outstanding Teacher of the Year is really a tribute to all of the great teachers who inspired and nurtured him along the way. When he learned that he was named a finalist for the Illinois State Board of Education-sponsored award, his thoughts turned first to his wife, elementary education alumna Jennifer Sims Bierbaum ’06, then to the amazing teachers, friends, colleagues, and community members from whom he continues to learn the art and science of teaching. Having recently earned national board certification, he is now enrolled in the principal preparation program in the Department of Educational Administration and Foundations. Bierbaum teaches a lesson on 9/11. He has had to adapt to the fact that kids don’t need him as much for basic information anymore. “They have knowledge right at their fingertips—I mean, they can go to Google and find just about anything!” he said. He looks to examples in students’ everyday lives and in the community to engage them. “My role is to make sure that their learning does not end the moment they walk out of my classroom,” he said. Opportunities to connect the community and classroom are what former NCWHS student and current Illinois State University marketing major Emily Klay remembers most about having Bierbaum as a teacher. Klay was an active member of the Social Studies Club and participated in the NCWHS archival project, both facilitated by Bierbaum. Among her favorite club-sponsored activities included a presidential election return party, going to the midnight premiere of the movie Lincoln, and joining state and local leaders at a Lincoln-themed fundraising dinner. Bierbaum’s love for the profession is one of the things that Illinois State University Professional Development School (PDS) intern Amy Rudnick said comes through in everything he does. Bierbaum will serve as Rudnick’s mentor teacher for an entire school year. “What better teacher to learn from than one of the top teachers in Illinois?” Rudnick said. It would seem this busy father of two has limitless energy; he “brings it” to class every day! After the last bell rings, you might find him sitting on the corner of his desk eating an apple and enjoying a lively discussion with his students about who was to blame for the government shutdown. This is why he loves teaching and this is what makes every day is a great day to be a Wildcat!